This is seriously insane and I'm upset I didn't think of it first. If you're a crafter you're going to kick yourself for not turning your rainbow loom obsession (it is not just for kids and you leave me alone) into a lucrative eBay auction, because a UK mom is about to make a quarter of a million dollars for the dress she made with just her handy loom tool ($19.95 at all fine Michael's locations, but I got mine for like ten because they always have sales) and a whole mess of rubber bands (very, very cheap). 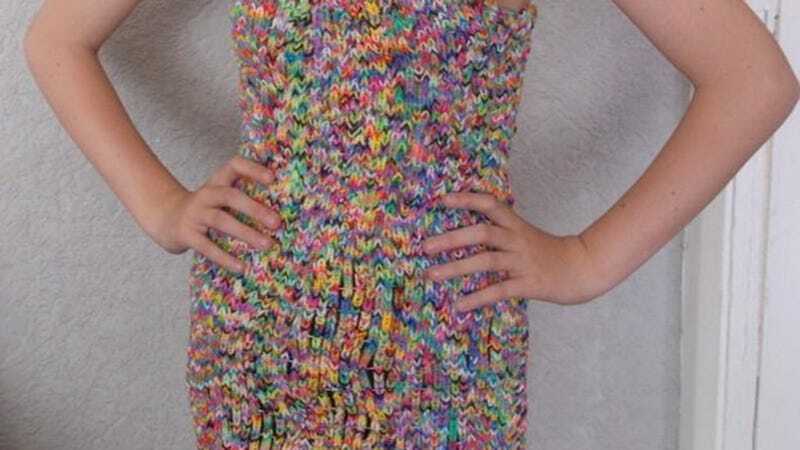 The dress is attractive and probably took a very long time and a lot of effort to make (have you ever had a rubber band jump off the loom into your eye? It burns!) but is it worth almost three hundred thousand dollars? Decide for yourself. You've got less than 24 hours to bid and the dress is a size 4/6. That means Regina George probably wouldn't be able to wear it to the Spring Fling. But there's always Sears!